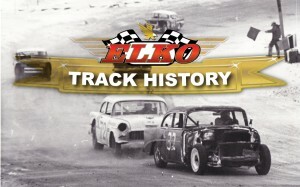 The 2015 season marks fifty years in business for Elko Speedway and we aren’t stopping here! We have much more in store for the future and look forward to continuing to make Elko the place for families, young and old to enjoy for many years to come. Racing in the 2014 season at Elko was nothing short of action packed for race fans, crews and drivers. Drivers from all over the Midwest competed in our NASCAR sanctioned races every Saturday night. Families were able to watch in excitement as our track champions raced to the top. The 2015 season looks to be even bigger than the last, with 94 different cars showing up for our 2015 Test & Tune the count is looking good. After 50 years of racing, we are sure to have an exciting year. For many Elko fans this has been a life long experience. Since it’s beginnings Elko has always been a place for high speed entertainment. The track opened in the summer of 1965 and has since been one of the Midwest’s top short tracks. In 1987 Elko became one of very few short tracks in the United States to be NASCAR sanctioned. Since then brand new grandstands have been added along side of many other changes and track improvements. The 2014 season was a big year for fans and drivers, with the opening of the Elko Drive-In Theater, updated ticketing systems, improved credit card usage, updated entrance/parking and so much more. In 2015 we see the expansion of entertainment at Elko with the addition of Hornets Figure 8 racing, group qualifying and the allowance of tail gating in the parking lot. Enhancing the experience for Drive-In Theater goers as well as racing and entertainment seekers, the new tail gating policy will also be complimented with a beverage stand in the pits and a brand new concessions stand in the parking lot, serving alcohol starting on May 16th. Food and non-alcoholic beverages will be allowed entry into our parking lot and Elko visitors will be provided with designated barbeque areas. With 50 years behind it’s seat belt, 28 of those years being NASCAR sanctioned, the race track has had lots of challenges over the years. Gearing up for it’s 50th season brings more effort into social media, video production, adding a live track camera that can be viewed from the many flat screen televisions in the suites and Champions, accepting credit cards and developing a more engaging website are just some of the many technological advancements at Elko. Even the entertainment is taking a turn at Elko, with the added Drive-In Theater, with its 116-foot-wide screen and digital projection, Elko visitors find themselves with more and more options at their favorite venue conveniently 30 minutes from downtown Minneapolis. One thing is certain, the entertainment and exciting shows brought fans right to the edge of their seats for the past 49 years and with the 50th year approaching the quality of the Elko experience will only get better. With plans to bring in more entertainment for race fans, concert goers, entertainment seekers and Drive-In movie enthusiasts we are sure to have a great time in 2015. For a full, up to date schedule please visit our schedule page at www.elkospeedway.com/schedule/. Racing and entertainment returns to Elko for the 50th season this Saturday, May 9th, 2015. Hope to see you in 2015 for yet another great season at your home town race track and entertainment center, Elko Speedway! Click the image above to visit our new track history page.